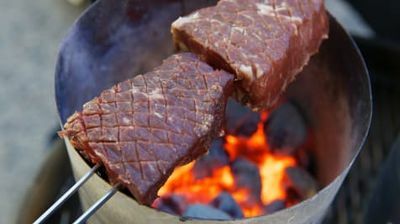 Test cook Dan Souza demonstrates how to make the Ultimate Charcoal-Grilled Steaks at home. Next, equipment expert Adam Ried reviews steak knives in the Equipment Corner. Then, gadget guru Lisa McManus uncovers the best jar spatulas and jar openers. Finally, test cook Bryan Roof reveals the secrets to making perfect Grilled Pork Kebabs with Hoisin and Five-Spice.